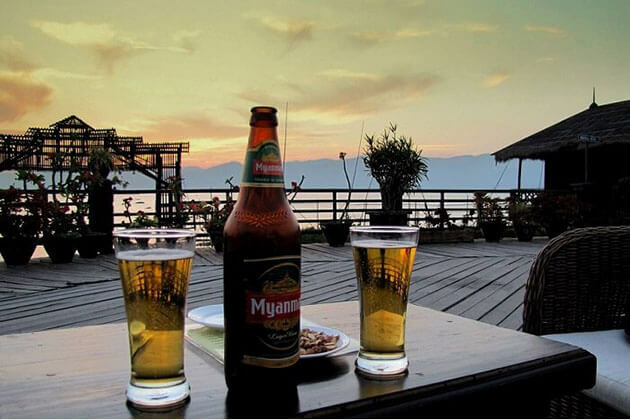 Myanmar river cruise makes you fall in love with the fascinating landscape of Myanmar (Burma) at first sight! Unlike any hectic countries in the world, the laid-back pace of life, the gentle smiles, and forgotten villages are the reason why you should take a river cruise to discover it slowly. And now, it is the right time to plan for an adventure to explore the hidden charm shrouded into heritage sites. Our luxury river cruise in Burma will take you through the most gorgeous parts of the scenic Irrawaddy River and Chindwin river. In each destination of our Myanmar river cruise, expect to be feasted by the serene landscape along the river that blends with the light wind and the bright sunlight. Myanmar, it might be a bit different from your imagination, will lure your heart, not for the picturesque scenery but unsung destinations awaiting to discover and uncover. From the ancient temples and monasteries to the traditional villages; the grace temples to the colorful market; follow our breathtaking cruise ship to engage with the friendly local. 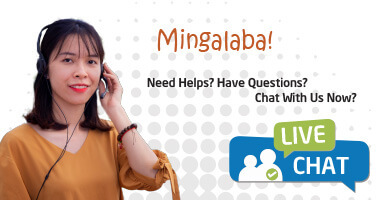 What’s a better way to experience the local’s lifestyle than try your hands on preparing a dish, making a pot under the guidance of the localhost? The traditions, as well as the vibrant customs, will ensure not only memorable but also precious. 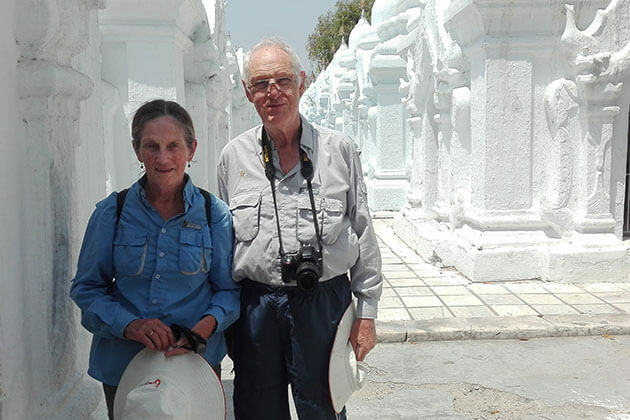 Go Myanmar Tours offers a variety of best Myanmar river cruises 2019 including Irrawaddy river cruise and Yangon river cruise for passengers to enjoy the essence of Myanmar along gentle rivers. Contact us to book or tailor-make your own itinerary for your best river cruise in Burma that meets exactly your taste and need. 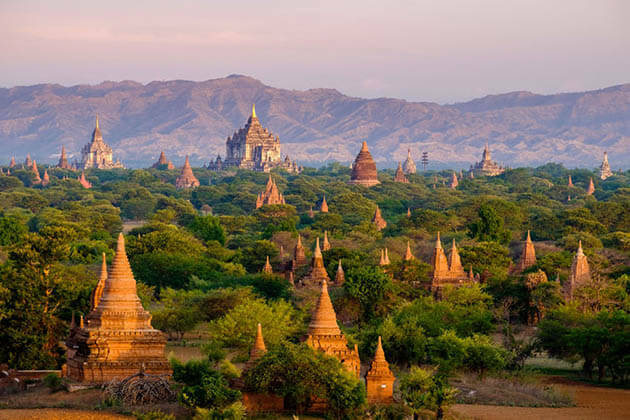 Myanmar now shows its natural charm for a spectacular adventure in the country of grace temples, colorful markets, dynamic festivals, and remote villages. Myanmar river cruise is an intrepid and interesting choice for tourists to explore all things about Myanmar. The river cruise through Irrawaddy and Chindwin River offers from short to long distance and from luxury to traditional style with the wonderful and incomparable sightseeing. Irrawaddy River and Chindwin river are two most beautiful rivers for a cruise in Myanmar. For a long time, these two rivers have devoted to water transportation. That's where expose the vivid life of the Burmese people living sparsely along the riverside. Our luxury Myanmar river cruise 2019 will bring you to a lifetime excursion and offer you with amazing activities to do, let's check them out! The ancient town of Mingun is home to many Buddhist sites and monasteries to visit in Myanmar river cruise. Although the largest Buddhist pagoda in the world – Mingun Paya ( Pahtodawyi) is unfinished, its massive ruin is impressive enough to draw tourists' attraction for a river cruise in Burma. It's huge, but the chamber inside is relatively small. 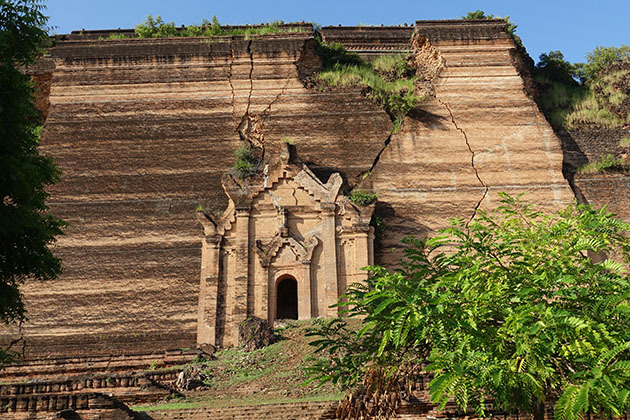 There are several stories led to the abandon of Mingun Paya that has been pass by generation to generation. To date, insufficient labors have been considered one of the main reason. Another story foretold that if the pagoda was complete, then the kingdom will come to an end. Tourists traveling to the pagoda can climb up to the top to marvel at the view surrounding. It takes 45 minutes to travel on a boat trip to reach the town and our Myanmar river cruise will drop you at Gawain Jetty to begin your excursion. 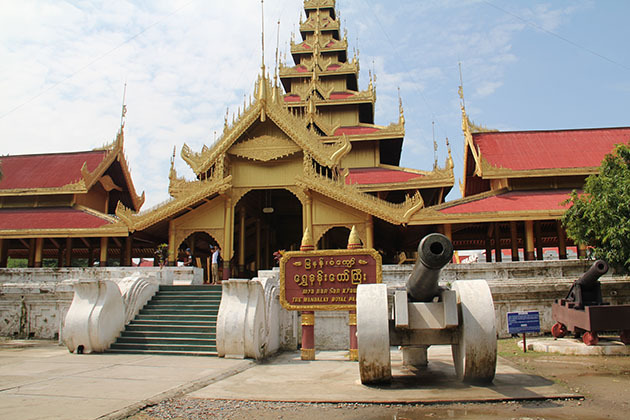 Together with Mingun Paya, there are some of the most popular destinations to visit in Mingun from Myanmar river cruise including Mingun Bell - the world's second largest ringing bronze bell. The massive white-washed Hsibyume Temple which is almost unreal that you have to see it and scream "oh my goddess!". 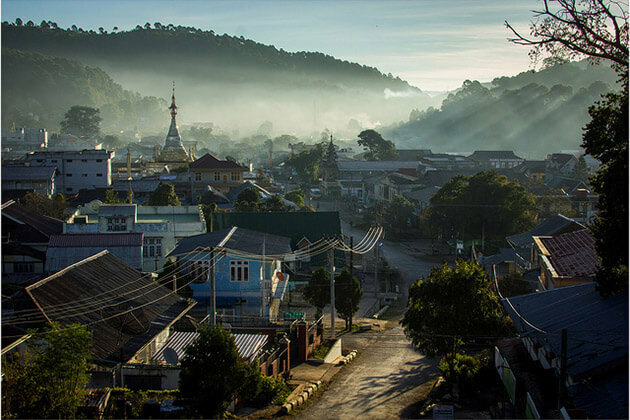 The second largest city of Myanmar has never been praised to be one of the most charming attractions in Myanmar. Nevertheless, once exploring it from Myanmar river cruise, no one can deny the truly fascinating as well as the allure of the city. Mandalay is not only the city of pagodas and monasteries, but it is also home to the Royal Palace of the last Burmese King. Tourists visiting Mandalay from Myanmar river cruise will have a chance to marvel at the impressive golden palace; witness the world'largest Buddhist book carved on 729 marble slabs; admire the unique architecture; and hike up to 1000 steps to reach the glistening pagoda on the top of Mandalay Hill to enjoy the majestic sunset over the region. Together with sightseeing, tourists from Myanmar river cruise can expect to try hands-on making the gold leaf or to make a pot under the guidance of the artisans to gain more about the local experience. 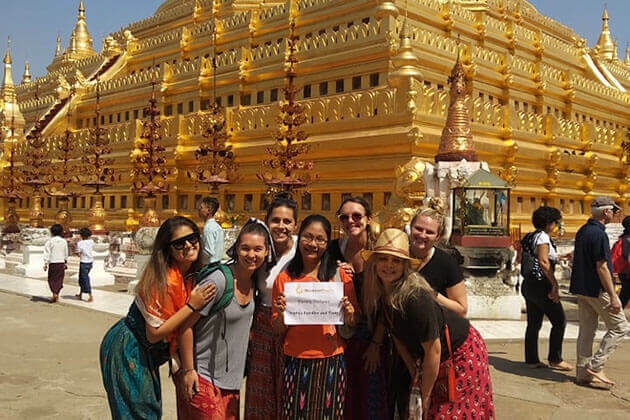 Exploring the temple town of Bagan is a dream of any visitors traveling to Myanmar and so does our customers from Myanmar river cruise. 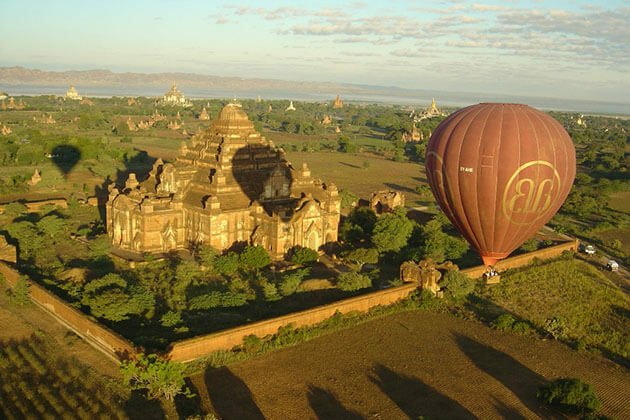 With over 2200 pagodas packed into the tropical landscape, the best way to marvel at the landscape of Bagan after docking from the cruise is taking a hot air balloon trip. As the sun flickers in the sky, there isn't more eye-opening experience than floating on the hot air balloon and see the foggy cover all the area. 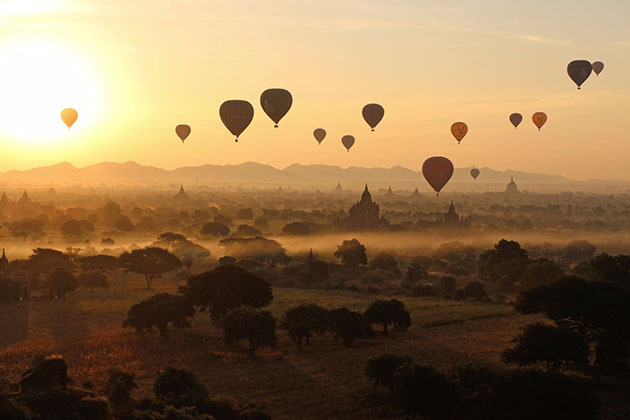 From the hot air balloon, wait until the sun rises slowly and shines its light to all the ancient temples. 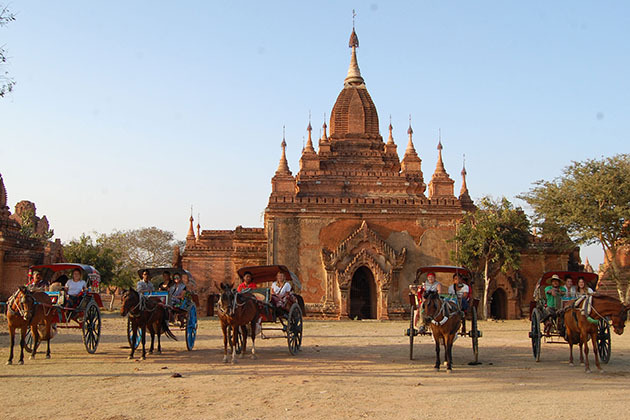 If a boat trip gives you a glimpse to the outside Bagan along the river, hopping on a Pony cart in Myanmar river cruise will offer you a classic way to explore Bagan. Although a part of tourists chose to take a taxi to escape from the dust and heat; those others chose to take a bike. 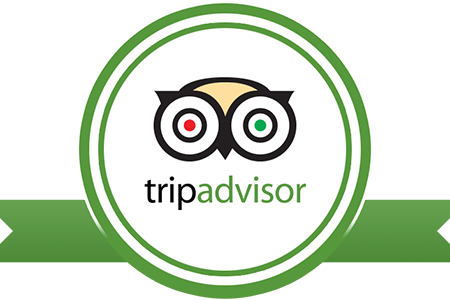 However, we highly recommend you to experience a unique horse carriage after disembarking from your Myanmar river cruise to have a closer look to Bagan. The cart will slowly take you through the unnamed temples to the most impressive and important pagodas to learn about the history as well as the fantastic architecture. What's more, the local driver will carry you to some interesting destination that difficult to access by car and hard to find by foreigners. The largest city of Myanmar is one of the main attractions for any Burma tours, so does our Myanmar river cruise. However, if you are thinking about a large city with a hectic pace and luxury service, you will be astonished when you witness the city in real life. Yangon is unlike any large cities in the world. It does not enchant you by the chaos or the noisy of scooters and cars swarming around the street. 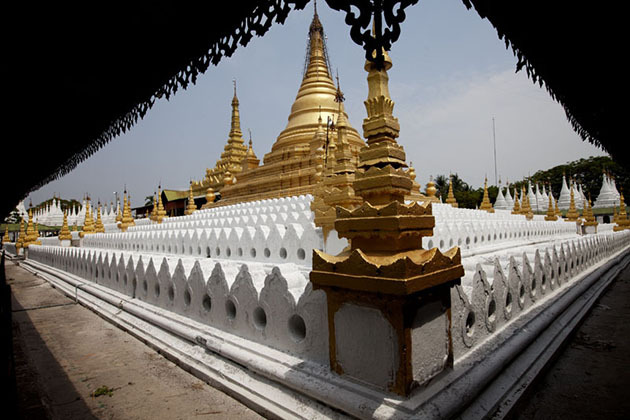 A visit to Yangon from Myanmar river cruise will bring you the feeling of stepping back to centuries with its laid-back pace of life and dignified gilded pagodas dating back to thousand years ago. The unique architecture features on the mossy tiled buildings along the street. 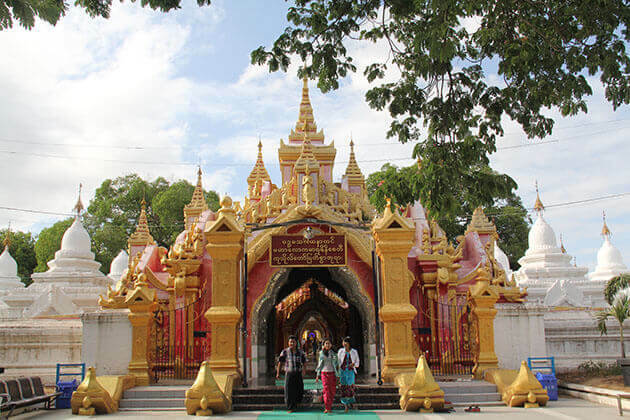 Upon Yangon, there are myriads of things to do, taste, and discover. From the bustling market to the colorful street food stall especially the glittering pagodas dating back to thousand years ago. All are rolled into one to deliver you a remarkable river cruise in Myanmar. 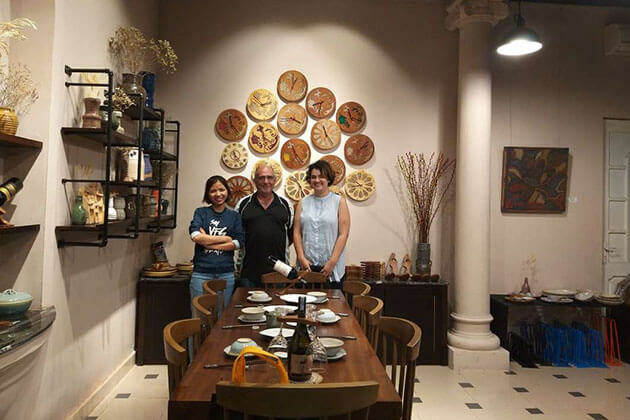 Visit Twante – The Village of "Oh-Bo Pottery Shed"
The peaceful city of Twante is one of the ideal places to visit from a Myanmar river cruise. 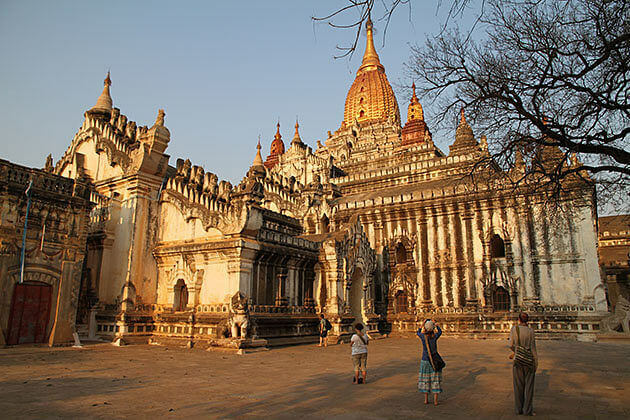 Situated in the Irrawaddy River, it noted for the 2500-year-old Shwesandaw Pagoda and the traditional pottery making. 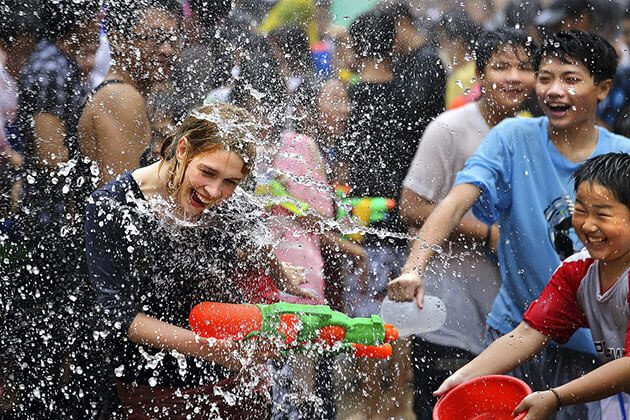 Besides, the one that impresses you is the smile of kids and the daily activity of people. Upon Twante, tourist will have a chance to sightseeing around the city on a trishaw – the most popular means of transportation in Myanmar.